In recognition of National Random Acts of Kindness Day, which was Feb. 17, You Be the 1 launched as an initiative that fosters understanding and encourages action to help young people with the often hidden issues they face - from eating disorders to cyber bullying to depression. 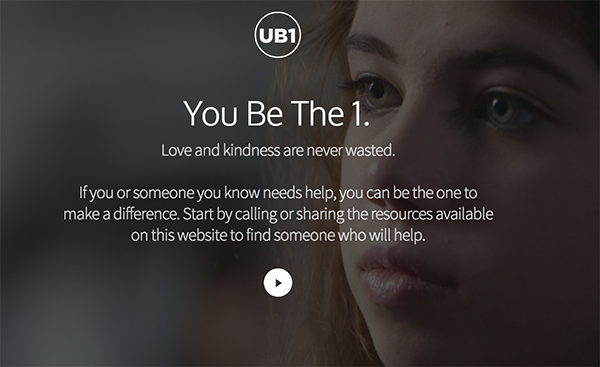 Through a short and compelling video and website with links to organizations, You Be the 1 also provides resources that help youth cope with challenges as they navigate through the formative years of their lives. You Be the 1 was created by May and John Bumpus, a Nashville couple who are seeking to encourage people to notice the often concealed issues faced by young people and to share access to the myriad of resources available. "The goal of 'You Be The 1' is to remind people of the struggles confronted by young people and encourage them to take a moment and make a critical difference in someone else's life - and then, hopefully share this sentiment with others," said May Bumpus, who produced You Be the 1. "The teenage years can be isolating and the issues youth face are more complex than ever. By also raising awareness of the many organizations standing by to help, we hope to connect young people with professionals who can address these often serious needs." The Mayor's Youth Council, which serves as a link between Metropolitan Government and the young people of Nashville, was involved with the launch of the initiative by hosting a kick-off event and conversation to discuss ways to encourage everyday action on these often concealed issues. Other nonprofits involved in You Be The 1 include: the Anxiety and Depression Association of America, Beneath the Skin, the Boys and Girls Club of Middle Tennessee, the Oasis Center, Renewed: Eating Disorders Support and STARS Nashville. "Young people today deal with a very different set of challenges than we've seen in past generations. Many times these unique challenges go unnoticed or are misunderstood," said Brandon Hill, Youth Engagement Specialist for the Mayor's Youth Council. "Nashville is a city full of caring, compassionate people who want to help which is reflected through the many resources available to youth through our nonprofits and community organizations. This initiative will go a long way in helping to connect youth to these resources and reminding them that Nashville cares about their well-being." The You Be the 1 video features vignettes of teens invisibly suffering from challenges, including bullying, stress, eating disorders, depression and abuse. Volunteer teenage actors from Nashville's Father Ryan High School, and the school's Fine Arts Department Chair, Kelli McClendon, contributed their time to help produce the piece. The You Be the 1 website provides contact information of participating organizations that can help with these issues. The complete list of these organizations can be found by visiting www.YouBeThe1.com. "Love and kindness are never wasted," said May Bumpus. "Together, we can spread this message of noticing struggles and then reaching out to make a difference in the lives of our youth." For more information on You Be The 1 and to view and share the video that encourages compassion and kindness, visit www.YouBeThe1.com.